Snap Shots (formerly Snap.com) has launched a new feature with great potential. They warn that it is still “beta”, and needs to be improved, whatever that means. (I’ll try it in the next post.) 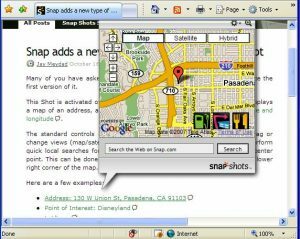 SnapShots is the free website “plug-in” which puts the little balloon next to all the outside links on my webpage, and if you hadn’t noticed, hover on the balloon and an image of the page linked-to pops up. These little pop-up windows are irritating to some people… at least some vocal people in the blogsphere say they should be banned. Maybe they are not all that useful. However, this new MapShot feature (a fully-functional pop-up Google map), with a built-in “local search” for restaurants, hotels, etc. could be used creatively (think online directories, travel sites, New York Times…). Who is snap.com? 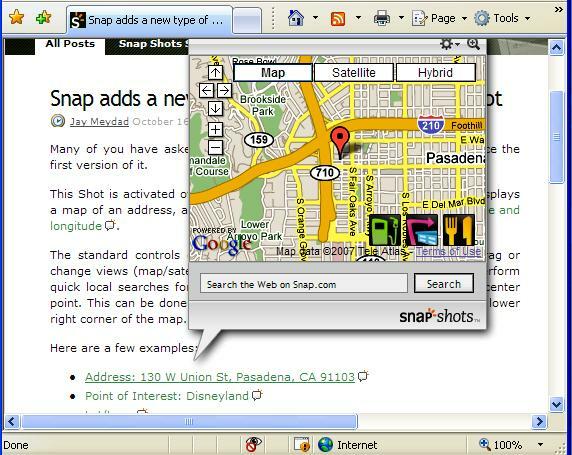 Snap Technologies is one of the Idealab companies. Idealab is the renown technology incubator, based in Pasedina CA, founded in 1996, with former fledgelings including PETsMART and Picassa.